A new digital paintbook is being released right now by German publisher Newart Medien & Design, publisher of the digital workbook from Roger Hassler. There is actually a facebook site that keeps you updated about new issues, as also a twitter stream. Actually the book is written in German (sorry for those interested in purchasing) but I do my best to make this one a worthwhile read for all you English speaking readers. 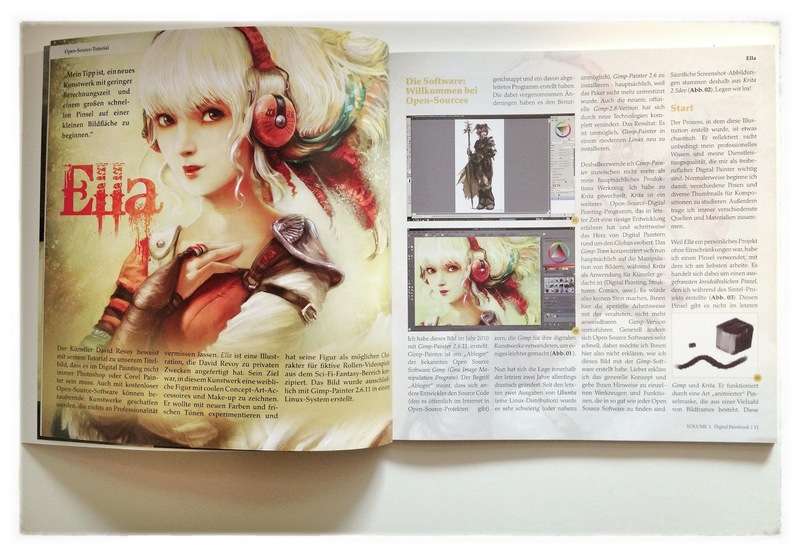 The “Digital Paintbook” is the direct successor of the German edition of 2Dartist Magazine. The difference to the 2Dartist magazine lies in the format which in this case is a book rather than a magazine. I for one embrace this new format as it has an intended workbook feel to it, that is designated to be a steady companion for your work with the computer as tool of the trade. And I have to say it has also a place on my desk for a while now, this alone makes the book a nice piece of useful paper that will not look bad after you have flipped 156 times through it, to absorb all the information. The tutorials cover wide aspects of digital creations such as caricature designs, matte painting, speed painting and of course – digital painting in a variety of programs! This nice handbook features also an artists gallery as a display for inspiration. The price is also in a mid- range for around 14,95 € (19,40 USD) for its nearly 80 pages and can be purchased via Amazon too. Artists in the book include: David Revoy, Daniel Czaja, Bente Schlick, Tony Andreas Rudolph, Helge C. Balzer, Joachim Simon and yours truly. The book sets out to have quality content and the great print quality plus the rich design is proof for that. This means for artist wanting to display their art in the gallery, there is an option to submit! And for German readers, this might be a call as well to submit for possible, future publication of your workshop or tutorial. Find more information about that matter here, or send me a message and I´ll answer or forward it. I don´t know if an English version is planned, but if so, you´ll find the information appended here. I hope you enjoyed this article, and even if you don´t speak German, if you know someone who does, this book might be the perfect gift.